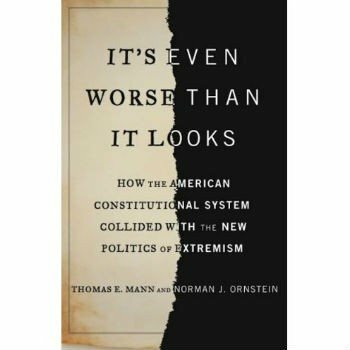 Thomas E. Mann and Norman J. Ornstein, two eminent Congressional scholars, co-authored their latest book on Congress earlier this year. In It’s Worse Than It Looks: How the American Constitutional System Collided With the New Politics of Extremism, the authors analyse and lament the “asymmetric polarization” that the Tea Party Republicans have brought to the 112th Congress (2011-2013) by opposing almost all Democratic initiatives like an adversarial, parliamentary party. They conclude that the American system of a separation of powers necessitates inter-institutional opposition between the Presidency and Congress as a whole, and therefore “cross-party cooperation” between Democrats and Republicans in Congress in order to achieve meaningful outcomes. They reject the tendency toward parliamentary-like opposition between Democrats and Republicans within Congress as inherently incompatible with the separation of powers (i.e., the Balanced Constitution) that defines the presidential system. (Unfortunately, my e-reader version of the book does not preserve the proper page numbers). In Chapter 6, “Reforming U.S. Political Institutions”, the authors muse about constitutional amendments that would turn the United States into a parliamentary republic or, less drastically, eliminate the mid-term elections such that the House of Representatives and the President would be both elected every four years, and Senators would serve terms of 8 years. They reject both ideas out of hand because they are unattainable; after all, Americans “are understandably proud of the world’s oldest constitution and an independently elected president” and would not support such a drastic constitutional shift. First, even a parliamentary republic could include a directly elected president, though he would most likely be a non-executive head of state. Second, I must disagree with their characterization of the American constitution of 1787 as the world’s oldest. They could reasonably conclude that their Constitution of 1787 serves as the oldest codified constitution that has remained constantly intact throughout its history and is still of full legal force and effect today. Their statement glosses over some important distinctions and demonstrates a strong tendency toward what intelligence analysts call “mirror imaging.” Americans understand “constitution” as a specific written document that codifies a general framework for the functioning of the political system, whether at the federal or state levels, and requires a super-majority to be amended. The Constitution therefore occupies a place over and above standard legislative statute and executive regulation. However, in the British sense, “constitution” refers not to a single written text, but to an “entire global system of rules and principles which govern the exercise of constitutional authority,” which may include legislative statutes of constitutional significance and certainly includes a conventional constitution of unwritten rules and norms that evolves over time. I would therefore argue that the British Constitution is far older than its erstwhile 18th-century American offshoot. 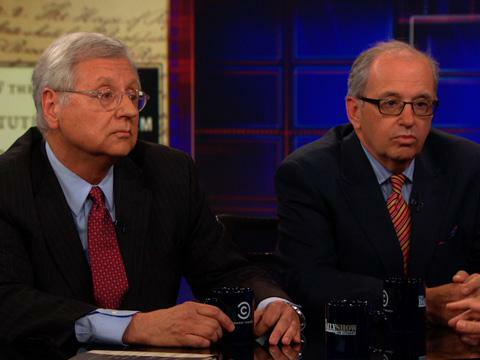 The “mirror imaging” comes into play because Mann and Ornstein probably never even considered the possibility that “constitution” entails a different meaning and outlook on government, depending upon the jurisdiction. They of course wrote this book for an American audience, but as scholars of Congressional history, they should be aware of its parliamentary antecedents. I will not excuse them for having omitted “oldest codified constitution”! In the same chapter, they discussed the possibility of “shifting authority between and within branches” as a remedy to deadlock and political paralysis. The general trend in American history has seen a transfer of power from the legislature to the executive. However, I know of no formal constitutional amendment that has transferred powers and authorities from the legislature – which the Framers intended to be the most powerful branch – to the executive. They also do not mention any statutes that have effected these shifts. Curiously, they also described such transfers of power as “an inevitable consequence of a constitutional system that enables separate institutions to compete for the exercise of shared power.” This assertion presents several problems. First, the transfer of power (presumably by convention and not by the written constitution) from the legislature to the executive is not “inevitable.” I refuse to legitimate such facile dialectics as sound scholarship. Second, in many cases the Congress does not “share power” with the Presidency; instead, Congress (particularly the Senate) can only check the powers that the Constitution of 1787 granted exclusively to the President. For instance, the Constitution grants the President the power of appointment of his cabinet, ambassadors, and judges, but the Senate must confirm those appointments. The Senate therefore does not possess the power of appointment per se – it simply affirms or rejects the President’s choices. It acts as a safeguard. In diplomacy and war Congress does possess its own constitutional powers that balance out those of the President. The President possesses the power to conduct foreign relations and is commander-in-chief of the armed forces; meanwhile, the Senate holds the power to ratify treaties, and Congress as a whole possesses the power to declare war. However, by convention, Congress’s power to declare war has become inoperable or irrelevant, because countries no longer declare war on one another. I lived in the United States from grade 8 to grade 12 and recall an interesting exchange on government fromy my 9th-grade history course. Much to my surprise, Mann and Ornstein repeated the same misconception in their book. My teacher asserted, “America is not a democracy. It is a republic” — as if “democracy” and “republic” were mutually exclusive. She attributed “republic” to representative institutions and regular free and fair elections, etc., and democracy to ochlocracy, or mob rule and tyranny of the majority. Mann and Ornstein also adopt this imprecise definition in Chapter 7, “Navigating the Current System,” where they argue that “America’s [system] is a republican (that is, representative) form of government, not a direct democracy.” By Mann’s and Ornstein’s definition, the United Kingdom and Canada would also be republics – which clearly they are not – because their Houses of Commons qualify as representative institutions. Americans tend to think of “republic” in strict 18th-century terms as a political system based on the rule of law and a constitution that somehow delineates between the executive, legislature, and the courts. Before the advent of Responsible Government within a constitutional monarchy and parliamentary system in the 19th century, the American view of republic made more sense than it did in the 20th century or does in the 21st. But even then, the United Kingdom has operated under some form of constitutional monarchy, with firm legal limitations of the King’s powers, since the Constitutional Settlement of 1688. The classic American view also ironically relegates “democracy” (which the Ancient Greeks considered the good variant of rule by the people) to the pejorative status of ochlocracy (which the Ancient Greeks considered the bad variant of rule by the people). In reality, a republic refers to a polity whose head of state is not a hereditary Sovereign; the term can therefore encompass both dictatorships like China and constitutional systems like the United States. Similarly, a monarchy can manifest itself in a myriad of forms, from a totalitarian dictatorship like North Korea (it does have a hereditary ruler), or a constitutional system like the United Kingdom. Mann’s and Ornstein’s conception of a republic in fact describes any constitutional system based on the rule of law and could therefore include both constitutional republics and constitutional monarchies. As I never tire of reminding extreme republicans in Canada, a constitutional monarchy under Responsible Government secures liberty and operates under the rule of law just as ably as a constitutional republic. They should only oppose monarchy if it entails something akin to Stuart absolutism. They lament that “President Obama promised the country post-partisan politics, built on commonalities among Americans, not the divisive differences.” In my previous post on “The Contradictory American Presidency,” I demonstrated the absurdity of this line of thinking. Politics by nature is divisive because reasonable people may in good faith hold opposing views and beliefs on the same subject. “Post-partisan politics” is therefore a contradiction in terms because without disagreement, dissent, and debate, politics ceases to exist altogether, and we descend into some awful dictatorship of the absence of independent thought and speech. However, Mann and Ornstein instead foolishly attribute the failure of Obama’s promise of post-partisan politics to the Republicans, who “operated as a parliamentary-like, unified opposition party” in the 112th Congress. In reality, post-partisan politics quickly collapsed under the weight of its inherent contradiction. Any elected executive head of state who exercises political power, as the American president does, can only divide the electorate into those who support his policies and those who oppose them. In a free country, citizens can and should express their disagreement with their government, which is why I find this widespread denial of the basic facts of power and politics so frustrating. This recommendation also contains an imprecise definition of republicanism. By “republican norms,” they refer to the cross-party compromise within Congress and inter-institutional opposition between Congress and the Presidency that a presidential republic requires in order to function smoothly. But of course, the American electorate voted in 2010 for the Tea Party Republicans, whom Mann and Ornstein blame for the “asymmetrical polarization” that has paralyzed the Obama Presidency and accounts for the 12% approval rating of the 112th Congress. If the American electorate failed, in their view, to promote republican norms in 2010, they may yet fail again in 2012 and in any subsequent election. Americans use “divided government” to describe a state of affairs in which one party controls the Presidency while the other controls Congress (normally the House). The French refer to their equivalent as “co-habitation”. The phrase itself is misleading. Americans and Canadian often refer to “the three branches of government” (executive, legislature, and judiciary), but I maintain that “three branches of the political system” would be more accurate because “the government” refers to the executive. In the United States, the President, Cabinet, the armed forces, and federal governmental departments and agencies make up “the government,” for which the President takes ultimately responsibility. In contrast, Congress is the federal legislature and independent of the government. The legislature is the supreme law-making authority, while the government enforces and promulgates laws through statutory instruments like executive orders and regulations and through law enforcement. The authors also caution the American electorate against voting in “divided government” and argue that they vote for the same party for both the President and the Congress. I found this rationale curious in light of some of their earlier recommendations and arguments. First, “aligned government” would only encourage polarization and the intra-institutional opposition between Republicans and Democrats in Congress characteristic of a parliamentary system rather than the inter-institutional opposition between Congress and the President that the authors correctly identified as a hallmark of and necessary arrangement in a presidential system. In other words, this recommendation would, if implemented, probably serve only to contradict their own analysis of the nature of presidential republics! Second, the strategy wouldn’t necessarily work and would certainly not guarantee good government; after all, sometimes the President’s co-partisans in Congress vote against his initiatives, particularly in his second term or when he has become politically toxic. The Balanced Constitution necessitates compromise; as the authors argue in Chapter 5, “Fixing the Party System”, the American system of government “requires an unusual degree of consensus to act.” I therefore agree with the premise that congressional parties cannot act like parliamentary parties because of the fundamental differences between the Balanced Constitution and Responsible Government. Their view supports my hypothesis on the differences between loyal opposition in parliamentary-cabinet and presidential-congressional systems! I would also argue that any attempt to inject elements of the Balanced Constitution into the Westminster system in order to “check the government” would detract from loyal opposition under Responsible Government. The Government and Opposition both sit in the House of Commons, and the Official Opposition acts as a loyal, responsible alternative government that holds the current Government to account. Constitutional arrangement for inter-institutional opposition would change Responsible Government as we know it in Canada. Mark Lowenthal, Intelligence: From Secrets to Policy, 4th Ed. (Washington, DC: QC Press, 2009): 7-8. Reference re Secession of Quebec,  S.C.R. supra note 5 at para 32. James W.J. Bowden and Nicholas A. MacDonald, “Writing the Unwritten: The Officialization of Constitutional Conventions in Canada, the United Kingdom, New Zealand, and Australia,” Journal of Parliamentary and Political Law 6, no 2 (June 2012): 366-400. This entry was posted in Loyal Opposition, Parliamentarism v Presidentialism, Reviews and Critiques, Separation of Powers and tagged asymmetric polarization, Balanced Constitution, bipartisanship, checks & balances, democracy, divided government, inter-institutional opposition, intra-institutional opposition, Norman J. Ornstein, ochlocracy, post-partisanship, republic, Thomas E. Mann. Bookmark the permalink.